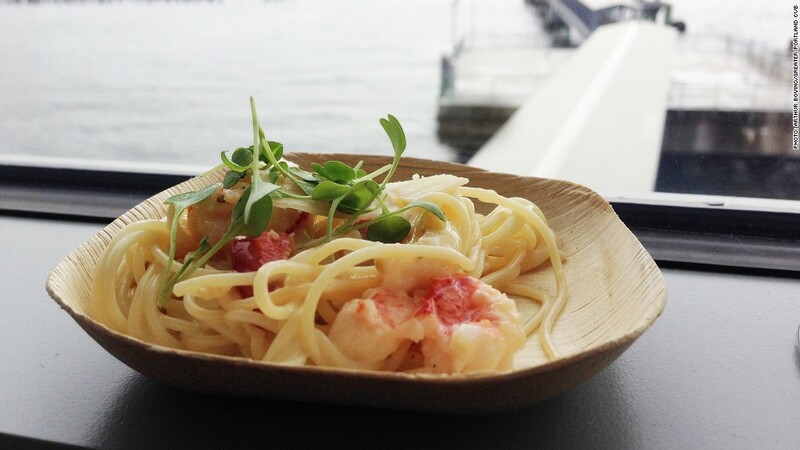 Lobster carbonara at the Harvest on the Harbor festival. There are nearly 600 restaurants in the city of 66,000 -- one of the highest ratios of any town in the country. Many of them specialize in fresh, local fare. Five Fifty Five currently has a local beef tartar on the menu, as well as Gulf of Maine cod and truffled lobster mac and cheese. Hugos is doing a tasting menu that includes rabbit with Brussels sprouts, spaetzil and mustard, grilled swordfish and a cream of broccoli soup. And Piccolo is putting an Italian spin on a local pork chop, hake, and an eggplant, tomato and ricotta dish. People choose local because it's healthy and supports the local economy, said Joe Appel, communications director at Rosemont Market, a local grocer. Plus, it's unique and gives people a connection to something in a world that feels increasingly impersonal. "Instead of getting your Christmas gifts at Amazon, you can buy local food," he said. The city hosts a four day food festival in the fall that showcases all kinds of local fare and chefs. Over 4,000 people attended last year -- twice as many as in 2008.